Mac and Cheese: Is This Family Classic Actually Toxic? Home » Food and Nutrition » Mac and Cheese: Is This Family Classic Actually Toxic? 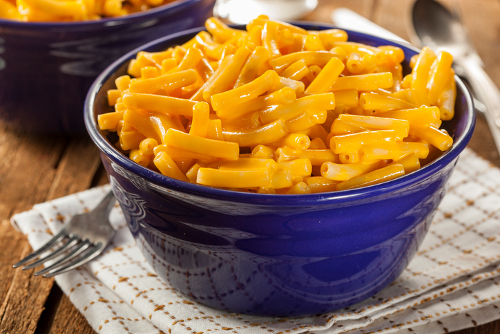 Recently, some shocking news emerged about the potential toxicity of one of America’s most popular foods: boxed mac and cheese. And I do mean popular—two million boxes are sold every day across the country, enjoyed (or at least eaten) by everyone from toddlers to grandparents. Study results indicated that phthalates (pronounced thal-eights), a chemical banned from teething rings and plastic toys about 10 years ago, are still found in high concentrations in boxed macaroni made with powdered cheese. But is this finding something you need to be concerned about? The truth is that it’s hard to say. The study, for example, was not published in a peer-reviewed journal, which means the results have not been examined by a team of professionals. It was conducted on behalf of food safety and public health groups to get the news out quickly, so that must be considered. Is Your Boxed Mac and Cheese Really Toxic? The health effects of phthalates have been well-studied in the past and the findings are rather worrisome. Phthalates are classified as endocrine disruptors and can lead to problems with testosterone, genital birth defects, and behavioral problems. The risks are highest for young children and pregnant women because phthalates appear to hamper development. So if this is the case, how do they end up in one of America’s most beloved classic dishes? These chemicals are not directly added to the food; instead, they leach in from packaging. Phthalates are also present in plastics and paints used in the manufacturing process (conveyor belts, etc. ), and they bind rather easily to dairy fats and other compounds. So, these chemicals are not just found in boxed mac and cheese, but also in cottage cheese, butter, packaged cheese, frozen fish, and more. America seems to lag behind other countries when it comes to phthalate regulation. And it could be harming our children substantially. China and other European countries have taken measures to limit phthalates in food packaging and processing materials, while the U.S. Food and Drug Administration (FDA) here at home still believes the levels found in American foods are safe. Many medical professionals and endocrine specialists have urged the government to adopt tighter regulations around these harmful chemicals. But until they do, what can you do? Here are three tips to limit your exposure to phthalates. They may be a little heavier and more expensive, but they won’t leach chemicals into your food. If you have a diet high in packaged foods, try to cut down on them. Focus more on fresh produce and baked goods and cheeses that aren’t sitting in a plastic bag or container. Depending on how often you eat the same packaged foods, you may have a relatively high toxic load. Switch up the foods you eat to reduce the risk. Rabin, R.C., “The Chemicals in Your Mac and Cheese,” The New York Times, July 12, 2017; https://www.nytimes.com/2017/07/12/well/eat/the-chemicals-in-your-mac-and-cheese.html?_r=1, last accessed July 24, 2017. Patel, K., “Fact check: Is boxed macaroni and cheese actually toxic?” Examine, July 18, 2017; https://examine.com/nutrition/fact-check-is-boxed-macaroni-and-cheese-actually-toxic/?utm_source=newsletter&utm_medium=email&utm_campaign=blog-071817, last accessed July 24, 2017.